You are here: Home » PROMISE Spring Opening Meeting at UMBC – Feb. 17, 2012. Have you missed connecting with other students from PROMISE? Are the great feelings from the PROMISE Summer Success Institute at the Sheraton in Columbia, and the Fall Harvest Dinner at College Park wearing thin from needing more interaction? Then, come on out to the PROMISE Spring Opening Meeting at UMBC and get rejuvenated. Come and meet other graduate students from diverse backgrounds! To read more about PROMISE: Maryland’s AGEP, visit the PROMISE AGEP website, learn more about the national AGEP, and see publications that discuss PROMISE and the signature programs. PROMISE is one of 22 AGEP alliances in the U.S. and is sponsored by the National Science Foundation. Students from UMBC’s campus may RSVP here on MyUMBC: http://my.umbc.edu/groups/promise/events/10483. Students from UMB, UMCP, or other campuses may RSVP as a reply/comment to this post. Please RSVP so that we can order enough food. As with any PROMISE activity, you are welcome to bring friends and family with you. ← Preparing for academic success in 2012: 5 things to do BEFORE classes begin. Just wanted to RSVP for the event and I look forward to meeting up with PROMISE again. I would like to RSVP for one person. I’d also like to RSVP for one. Is it too late to RSVP for 1. I think I might be able to make it. Sorry for the late RSVP. I will be attending. The PROMISE Spring Opening meeting was a great opportunity to “kick” off the semester. This has left us graduate students some very positive and active attitudes towards our goals. I was not able to attend the meeting but with comments from my fellow classmates: Josh Austin, Serina Woods and Melissa Davila Morris, I am inspired for this upcoming semester. In the opening meeting, led by Dr. Renetta Tull, she gave the background of the PROMISE alliance, informed students of the Imposter Syndrome and she highlighted several upcoming events. She also gave several tips for a successful semester. There were handouts and information distributed about the Imposter Syndrome and how to avoid it. 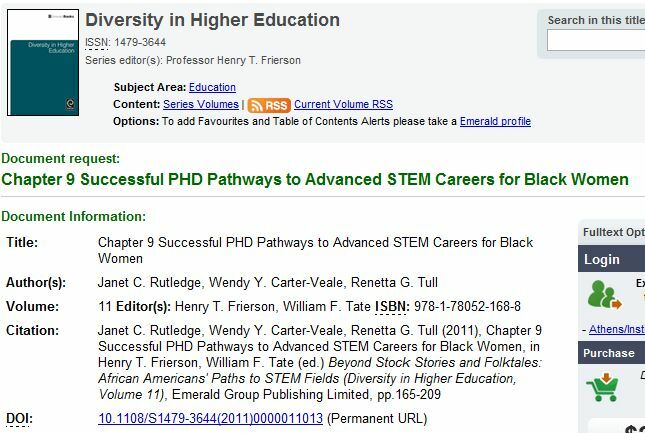 Dr. Tull also shared her recent publication with the audience, Successful PhD Pathways to Advanced STEM Careers for Black Women, and ways to access the paper. Closer to the end of the meeting, Dr. Tull opened up the floor for a small question/answer session. Based on some of the questions and responses, both students and professors provided many encouraging words. Many students emphasized the importance of defining yourself and the reason for obtaining a degree because it will help when faced with a variety of obstacles. They also emphasized the importance of networking and association with others in the same field, and how isolation will never get us the proper involvement needed. Attending and presenting at conferences will eventually strengthen your network throughout the scientific community and people will start to look out for your accomplishments and request for your expertise. Overall the audience emphasized the importance to be noble students, to be patient, hard-working, determined and focused to the finish! Although I was not able to attend the Spring Opening Meeting, I was able to speak to Patrick Carrington, Serina Woods and Joshua Austin about what they observed and learned. 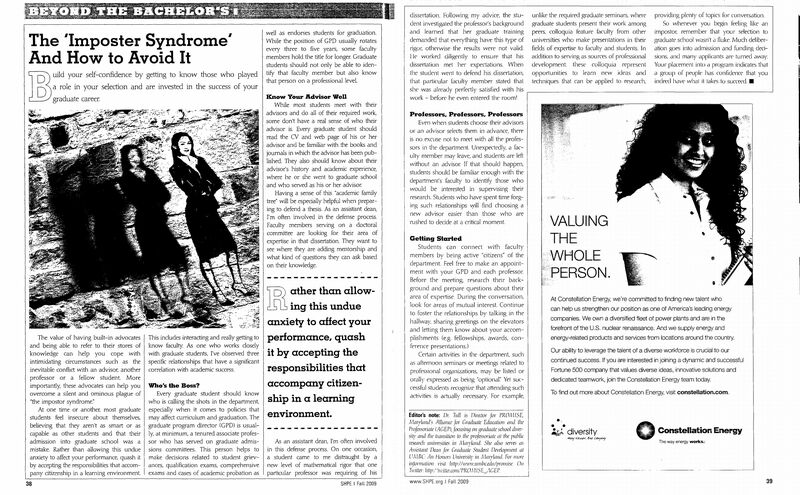 The Imposter Syndrome which I remember from the Summer Success Institute was discussed but it’s also helpful to occasionally be reminded of this “syndrome” to think of ways to overcome it. In addition the book chapter that Dr. Tull and Dr. Janet Rutledge are collaborating to write. Lastly the question and answer session at the end of the meeting provided a more interactive and personal experience. All 3 students said that they enjoyed the presentations and networking with other students at the end, which is also an essential component to the graduate school process. After we spent a brief amount of time to familiarize ourselves with new faces and and catch up with those we already knew, we started the PROMISE Spring Opening Meeting, covering a handful of important familiar topics including details about the Dissertation House, Summer Success Institute, and the Imposter Syndrome – a phenomenon that I learned could be experienced at any level of one’s career. We had several guests from Howard University join us at the meeting to learn more about PROMISE and it’s mission to connect and aid Maryland students who are on the journey through graduate school. We spent much of the meeting discussing subject matter related to the obstacles students face during this period, namely isolation, balancing life with work, condifidence, finding a good advisor, and establishing a strong network of mentors and peers. A recently published work authored by some of the UMBC staff about these issues from the point of view of African American women was brought up as a great reference for us all to read through and learn from. I appreciate all of the information that the faculty, staff, and some of the graduate students shared during the session, especially the comments made by Dr. Tull, Dr. Carter, Dr. Bediako, and Dr. Acosta. Thank you for your statements; they will certainly help me as I continue on my own path! I gained a lot of important insight from the Spring Opening Meeting last Friday. The quote that stood out to me was: “you will learn a lot about yourself and if you don’t define who you are and what you are to do with your life others will do it for you.” This is an important point in our lives and it was also advised that we be patient, hardworking, determined and focused. We should know why we are getting our degree and reach out to others when in need. We should not isolate ourselves from resources and other people. A point that stood out to support this was, “don’t stay in your apartment when there are those with available food outside.” It was also said to not be discouraged when we encounter obstacles and to get to know ourselves and what works for us personally. An important discussion came up about keeping in mind the “culture” of the research group or lab you become (or want to become) a part of. Know how your research advisor deals with their students and what their expectations of you are. Also look into how many students have come through their lab and how many have actually graduated at their hand. Another discussion came up about how to ensure your work or research is being put into (or used in) the field. To ensure others in the field and throughout the scientific community become familiar with your research and/or work it is important to attend and present at many conferences and events. Within context, people will begin to look out for your accomplishments and request your input, presence, and expertise. On the other hand, it was mentioned that sometimes your work is not used and even though you may develop things, your work may never become commercialized or put to use. The promise opening meeting was a great opportunity to see familiar faces and get updates on peoples progress and achievements. One of the common themes of the discussion that resonated with me was the importance of connections and support. Several people mentioned difficulties that they experienced and how they dealt with them. The opening spring PROMISE meeting was a fantastic way to begin the semester. Dr. Tull’s talk about the journey of graduate school was something I could relate to during this first year of my graduate studies. Her advice about finding your “niche” in regards to studying helped me examine how I best study effectively. I was able to pin point the environment I study best in as well the distractions that hinder my productivity. Dr. Wendy Carter’s advice on choosing and adviser and research lab left me feeling good about my research group decision. I chose my lab based on my research interests, as well as the amount of support I would receive from my adviser. I think the most important message I left with was the importance of using all of your resources and allying yourself with other graduate students. I have definitely taken that advice this semester by making myself more known within my department. Visits to professors’ offices are like second nature now. I have a set schedule of when I visit each professor. I feel as if I have the tools to be successful this semester.